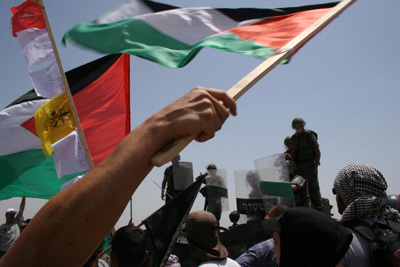 On Friday, the villagers of Bil’in, joined by international and Israeli supporters will hold a demonstration in which they will call for enhanced unity and internal dialogue amongst the Palestinian parties. They will use the occasion of the commemoration of the beginning of the Israeli occupation in 1967 act as a call for Palestinians to be united against the common enemy – the occupation. A large banner has been erected in Ramallah, calling for large-scale participation, and it is anticipated that it will be a particularly large demonstration this week. Politicians have been invited from both the Israeli Knesset and the Palestinian Legislative Council.